I reckon I’ve had about half-a-dozen pints of Emerson’s 1812 Pale Ale… over a period of about five years or so. I’d be way too drunk to write this review if I’d drunk all that beer in one go! Lame jokes aside, it’s fair to say that I’m pretty familiar with the Emerson’s range of craft beers, even though this will only be the second of the brewery’s beers I’ve reviewed following its delightful Daredevil Red IPA. Blurb on the bottle: There are two theories behind the name 1812. The first is that the kick of the hops imparts an aftertaste of such power, it’s evocative of the canons in Tchaikovsky’s 1812 Overture. The other one is it helped Richard [Emerson, the brewery’s founder] remember the last bit of the brewery’s phone number. We reckon we’ll go with theory one. 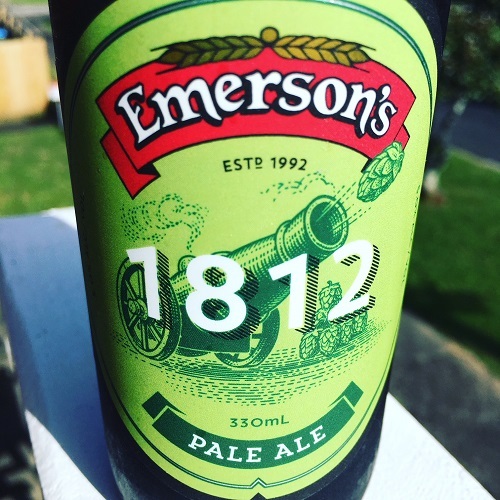 The review: Emerson’s 1812 Pale Ale was formerly known as 1812 Hoppy Pale Ale. I certainly wouldn’t go that far; this is quite a restrained pale ale, especially by today’s standards. In other words, it’ll get a hop-lover’s engine purring, rather than roaring. It’s clean and easy drinking, with a pleasant caramel-biscuit backbone. It has a citrus zing, which leaves me wanting just a little bit more, and a moderate bitter finish that lingers. The verdict: Emerson’s 1812 is a very nice drop. It’s not my all-time favourite of the Dunedin brewery’s wares (that’d probably be the aforementioned Daredevil Red IPA or the Bird Dog IPA) but it’d probably round out my top three. Beer/movie combination: Speaking of Tchaikovsky’s 1812 Overture, which this beer may or may not be named after… I think my favourite usage of this famous music is in the 1980 film Caddyshack.